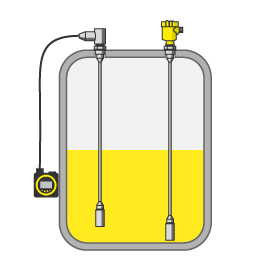 In continuous level measurement, the level of a medium in a tank or silo is detected with the help of different measuring methods and converted into an electronic signal. 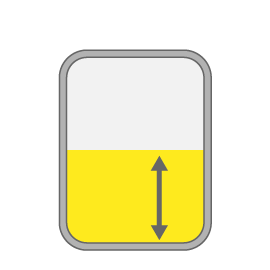 The level signal is either displayed directly on site or incorporated into a process control or management system. 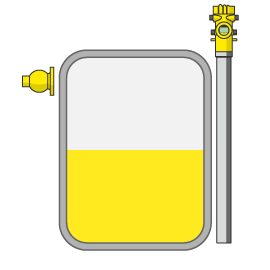 Typical applications for continuous level measurement are process tanks, storage tanks or silos in the process industry. In level measurement with guided wave radar, microwave pulses are conducted along a cable or rod probe and reflected by the product surface. The measuring probe of the TDR sensor ensures that the signal reaches the medium undisturbed. 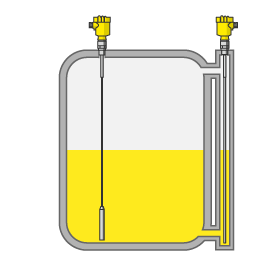 Liquids, bulk solids and separation layers (interfaces) in liquids are commonly measured with this measuring technique. In capacitive level measurement, the sensor and the vessel form the two electrodes of a capacitor. Any change in level causes a capacitance change, which is in turn converted into a level signal. Thanks to versions with shortenable cables and rods, the capacitive level sensors cover a wide variety of applications. In radiometric, i.e. radiation-based, level measurement, a slightly radioactive isotope emits focused gamma rays. The sensor, which is mounted on the opposite side of the vessel, receives this radiation. 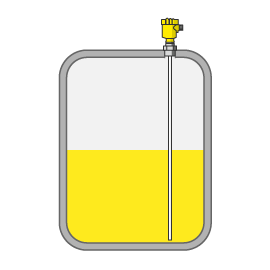 Since gamma rays are attenuated when penetrating matter, the sensor can calculate level, point level, density or mass flow from the intensity of the incoming radiation.